The IF trigger action is Twitter, New Tweet from Search. 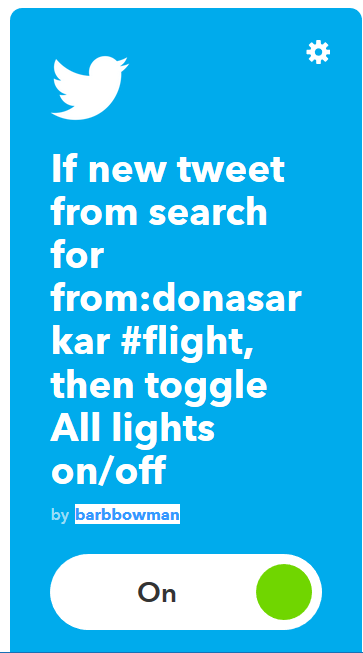 Just paste from:donasarkar #flight into the field provided. For the THAT action response, select the Hue or the LIFX service and then determine what you want your lights to do (lots of options here). If you want to be alerted every time Dona users the hashtag #windowsinsiders, you can create an Applet that uses a trigger action from:donasarkar #windowsinsiders. Enjoy! Let me know on Twitter @barbbowman if these work for you.